Daylilies are one plantbthat can be grown in every state of Austrlali. Old favourites and new releases are available for sale online in an ever increasing range of colours. The plants that we commonly know as Daylilies are Hemerocallis varieties. And with some species, and literally 100s of varieties available for sale online the colour range is incredible, ranging from white through to deep purples and multicolour. Daylily flowers get their common name from the the way that individual flowers only last for one day, however as each stem contains many flowers that open sequentially, they in fact seen to flower for months. To many gardeners these are a one of the easiest flowering plants to grow. And in a reasonable soil, and good sun you are pretty much guaranteed great flowers. All varieties are easy to grow in Australia, and readily available for sale online. Preferring a well drained sunny position and a slightly acidic soil they are an easy care plant once established. 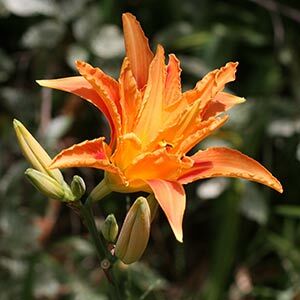 The classic ‘old fashioned’ Daylily Plant is the orange flowering variety pictured right, they are tough easy to grow and will naturalise into the garden, forming a large clump over time. However their are many more varieties available to todays gardeners. A very popular garden plant varieties such as ‘Stella Bella’ are a popular hybrid, Green Dragon is another. In terms of flower forms, spider, double, triple and other interesting cultivars are also available. Many daylily growers are hybridising plants with new forms and colours becoming available every year. of this easy to grow plant. Small or ‘dwarf’ day lily varieties such as ‘Cranberry Baby’ are also available, excellent for the front of the garden border. Some daylilies are evergreen and some are not, some of the varietiesthat are dormant in winter tend to do a little better in cooler climates, and some of the evergreens prefer warmer climates however remember that daylilies are fairly tough so give them a try. 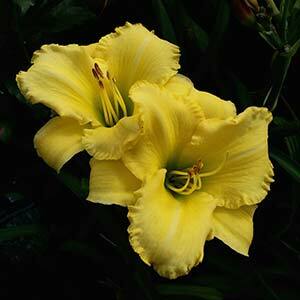 Daylilies are tough and can generally be planted at any time of the year. A humus rich well drained soil in a sunny position is best. If planting during warmer months water well until established. Deep watering in spring and summer and the application of a complete fertilizer in spring/early summer will enhance daylily blooms. Mulching can help improve soil and maintain moisture. A huge range of colours, doubles, spiders and even miniatures.Daylily nurseries listed below can provide more specific information. Daylilies purchased by mail order should be planted immediately, soak for 4-5 hours in a very dilute seaweed fertiliser. Did in some well rotted manure or compost before planting. Water in well after planting and water regularly until established, especially in warmer months. Daylilies can be divided or transplanted in spring. It is best to remove or prune away any old seed pods to promote new flowers. Daylilies also grow well in pots. Some water saving crystals added to the potting mix will help. One of the major problems is rust, a fungal disease that is easily spread, easily identifies by the raised yellow to ochre spots on the foliage, often on the underside of the leaf. Yellowing foliage is another sign. Not flowering, usually this is due to a lack of sun, daylilies love sun, 6 hours a day as a minimum, and the earlier in the day the better. So sun from 8am to 2pm should do it, until 4pm is better. Iris and daylily nursery with over 400 varieties, online shop with colour catalogue and paypal. Over 400 varieties, online shop with colour catalogue and paypal. Recent releases at competitive prices. Varying sizes, shapes, colours, forms & habit. Drought hardy. We specialise in selling at affordable prices. Latest from America. Huge eyes, widest edges, amazing frills. Mail orders. Large healthy plants.